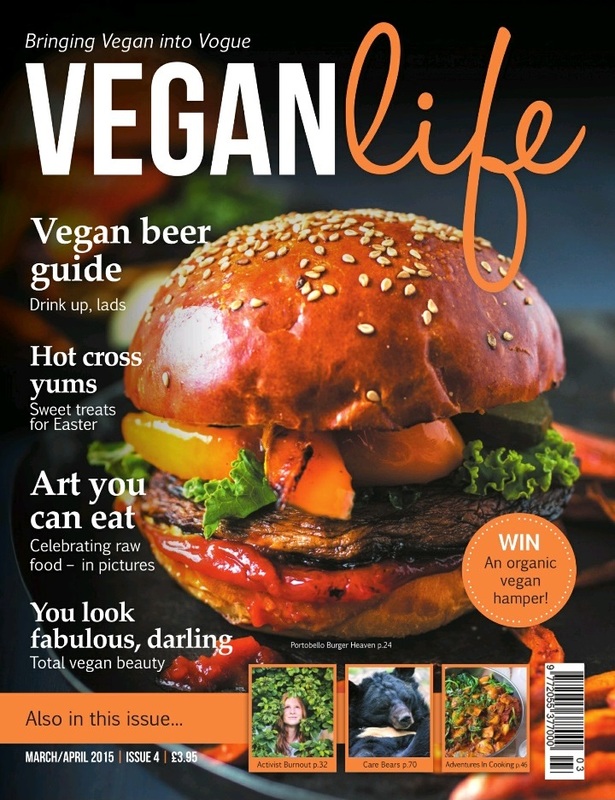 Edition 4 of Vegan Life is out, with another collection of fun facts, interesting articles, and delicious recipes. 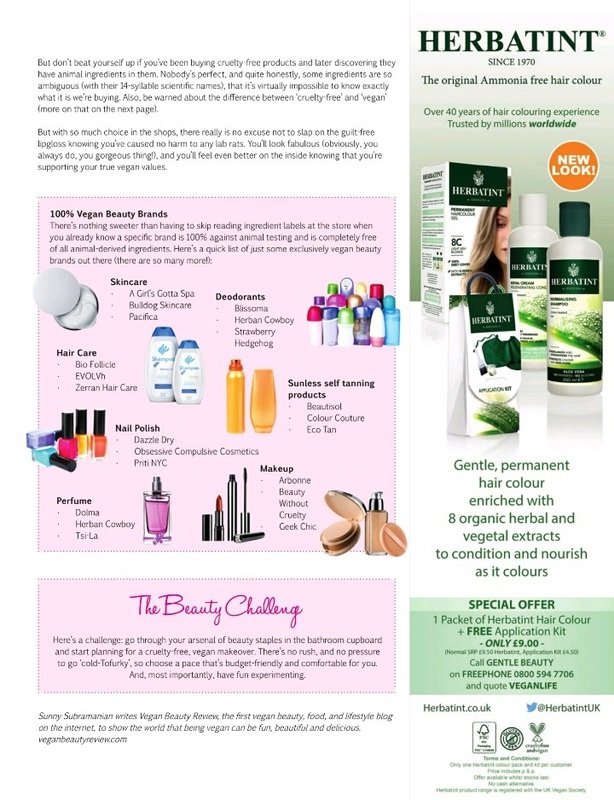 One of the pieces I particularly liked this month was a feature on vegan beauty products. I don't use a lot of make up or so-called 'beauty items', but do like to know what I'm using is animal friendly. The article talked about the difference between animal friendly (not tested on animals) and vegan (no animal ingredients) and highlighted that you can have one without the other. Plus, some vegan and animal friendly companies are owned by companies that don't hold those values. It's a bit hard to stay on top of it all, and so I really liked the round up of vegan and animal friendly options. I hadn't heard of most of the brands (which may be worrying!) but I will be on the look out now. It was also nice to read confirmation of the rumours about vegan Quorn products. Apparently they will be on the shelves in England by September 2015. It will be nice to have another range of products to consider, so I'm looking forward to seeing what they bring out. Equally nice, if you live in New York city, is the vegan creperie Little Choc Apothecary. It's based in Brooklyn and sells sweet and savoury vegan crepes. If anyone visits, please share pictures! If we ever visit NYC again, it will certainly be on my 'to try' list. 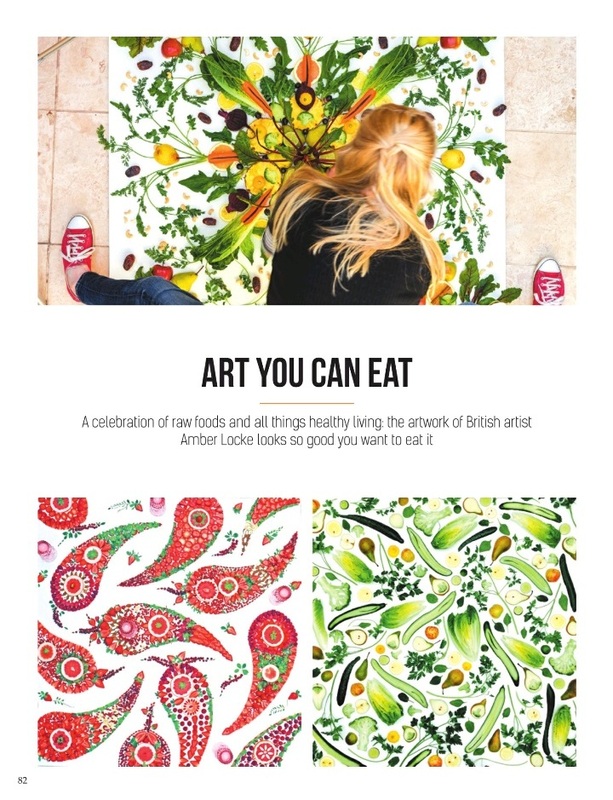 I also loved the pictures of Amber Locke's artwork. She arranges fruit and vegetables into gorgeous kaleidoscopes, photographs them, and turns them into prints. Aren't they beautiful? As always, it was a fun magazine to read and I also have my eye on an almond butter fudge recipe to try out. In the meantime, today is Shrove Tuesday, or pancake Tuesday. I'm sure those of you who are having pancakes will have chosen your recipe already (or even had your pancakes already), but the date seemed a nice opportunity to share some of my favourite vegan pancake recipes. 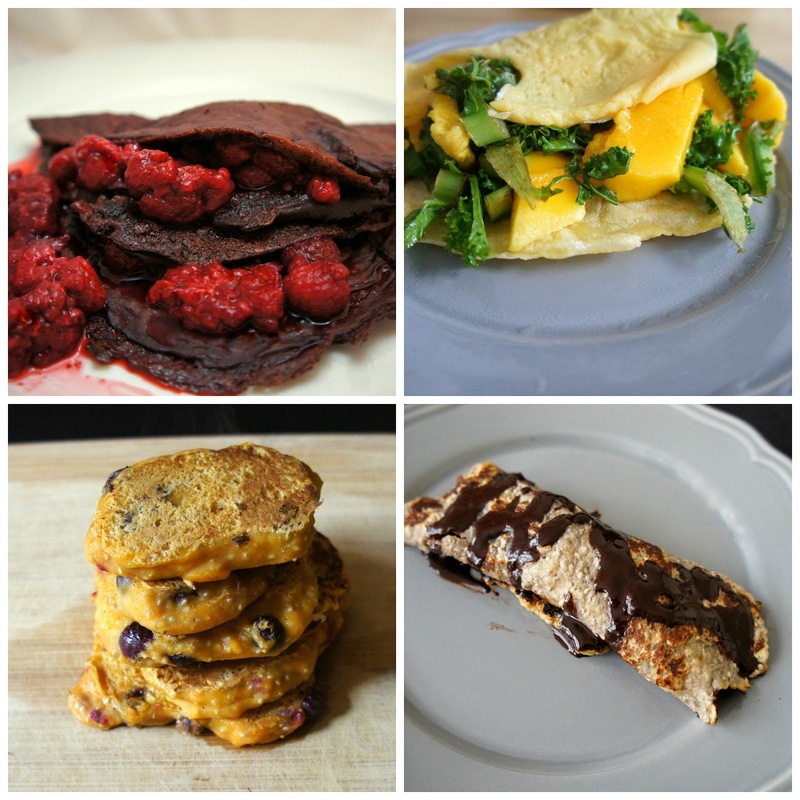 Making my top four, and clockwise from top left, are beetroot and cacao pancakes, served with raspberries; chickpea pancakes with spicy kale and mango; banana-chia crepes with an easy chocolate sauce; and pumpkin pie berry pancakes. Are you enjoying pancakes today? And what is your approach to beauty products - do you have brands you avoid for animal-related reasons? 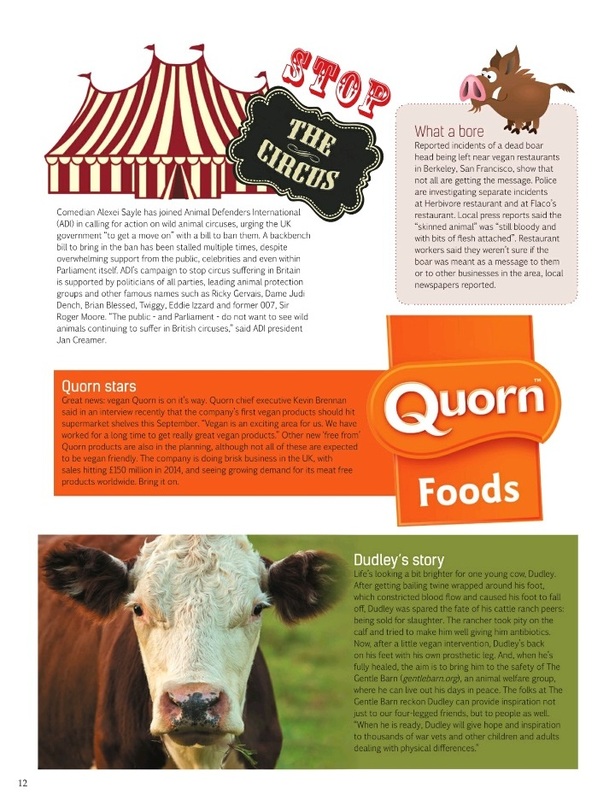 that's great news about Quorn! I wonder if they'll make the vegan range available in Australia? I remember there being a lot of Quorn products in WA, so I imagine so?! In the name of research, I feel like I should skip work today and head straight down to Brooklyn to that vegan creperie...don't you agree? Wow I love that vegetable artwork - have just had to find her facebook page to follow! I'd love on of her pictures in my kitchen if only I could find some space! And the beauty product article sounds very useful. Your pancakes look great too - did you make any of them for shrove tuesday? I didn't make any sweet pancakes this year but did make some basic besan flour ones to serve with a savoury bean filling...not quite to theme but we were heading out of London on Wednesday and dinner was made with little advance thought! I know, the burger really does look meaty!